We all knew before heading down that this race was something of an unknown quantity. With a crew that had only been together for a week of whom less than half had any tideway experience it could have proved very tricky if the conditions were bad. However, despite the torrential rain, conditions were almost perfect for a race, with virtually no wind. Off the start we hit a good early rhythm, overtaking our first crew within the first 30 strokes or so, but also being passed by Leeds University first boat at a similar point. Whilst we managed to hit a good rate of the start, it quickly dropped down to a more sustainable level , and as we were constantly spurred on by Chris telling us that we were closing on the crews ahead we held a good pace for the first part of the race. As we neared Hammersmith Bridge, we were closing fast on UCL 2, and could feel ourselves moving up on them, taking more out of them on each stroke, timing our overtake perfectly for the crowds watching from the bridge! After we passed them, despite closing on another crew in front, we struggled to push on from this point as we started to feel the effects of the long course. As we got more tired, the rowing became more scrappy and as a result our speed dropped off from this point onwards, despite the aggression and determination shown by the crew. In the end we finished a slightly disappointing 254th, but with plenty of positives to take from it we can build towards taking those lost places back next year. M1: [Cox] Cait Peck, [Bow] Elliot Carter,  Conor Burgess,  Rutger Grisel,  Paddy Buchanan,  Reuben Shiels,  Lachlan Jardine,  Joel Wilson, [Stroke] Will Miller, [Coach] Chris Smith, [Boat] Adrian Cadbury. M2: [Cox] Becca Odman-Stonehouse, [Bow] Alexis Baudelin,  Erik Wannerberg,  Ryan Davey,  Luke Saville,  Andre Thunot, Raphael Scheps,  Matt Folks, [Stroke] Tim Martin, [Coach] Chris Braithwaite, [Boat] Vicky Wade. 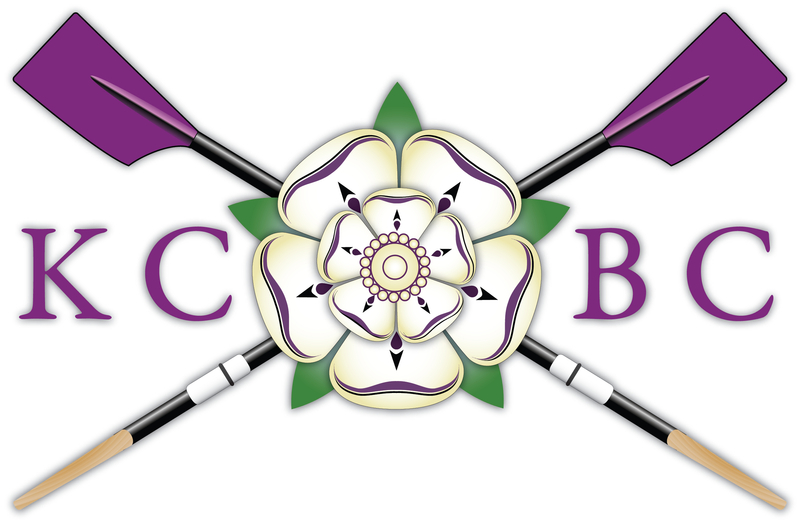 W1: [Cox] Nicole Samuel, [Bow] Naomi Fenwick,  Vera Koniesczny,  Felicity Eperon,  Liz Dzeng,  Sarah Hadman-Back,  Jess Robertson,  Matilda Greig, [Stroke] Marijne Mak, [Coach] Roger Thorogood and Chris Smith, [Boat] Jolly Roger. Unfortunately, it was a case of another day, another place moved down in the charts. We knew that the Selwyn crew chasing us had shown some fairly impressive speed throughout the term, but having sparred with them recently, we thought that we should be able to at least match them. Sadly it wasn’t the case as they went off the start looking like a crew that didn’t want to row the full course, having already rowed it once earlier in the day. We went off the start with plenty of aggression, but the pressure of a crew closing in on us showed, as they pushed us all the way up first post reach. The bump eventually came at first post corner, with us having stayed on station with Catz in front, who decided to take a trip into the bank just after we stopped chasing them! A fairly disappointing end to the week, but the crew can consider themselves very unlucky to have got spoons given the standard of some of the crews in the division. A much improved row by M1 today, however a drop in pace on first post reach allowed Catz to close significantly after what had been a rushed start for them. With them on our tails we lifted strongly several times through the corners but couldn’t make the pace stick and didn’t shake them off. We had a poor corner at Ditton, and were only saved by their cox’ awful attempt at steering for the bump, however they got us about 20 strokes later. Still not reaching our potential, tomorrow we have to prove we deserve our first division place. So it was the final day of women’s racing today due to WeHORR on The Thames tomorrow. We finally had a bit of breathing space at the BH as Churchill had been bumped down to 2nd Div. Just us and Selwyn next to each other having crew chats waiting for the time to get into the boat. We were all a bit tense, hoping that we could get the bump on Magdalene and that Selwyn didn’t have a mental start. Rowing up we did a good practise start to settle the nerves, although it was a bit windy and cold which had been unlike the last couple of days. In position 15 (Selwyn confused the whole div by parking in our position – they’d been there for 3 days so force of habit by the cox I suppose)!! Being pushed out I tried to relax the crew as we all knew the start was what meant bump or not! Bang: Better start then yesterday, blades were in water, always a good way forward! We got past our rhythm 10 and as we’d planned Roger called from the back for a lift which this crew has a speciality in. So we lifted it for 3 and power 10 to the motorway bridge to keep Selwyn off our backs. settle today, we started to hear horns. 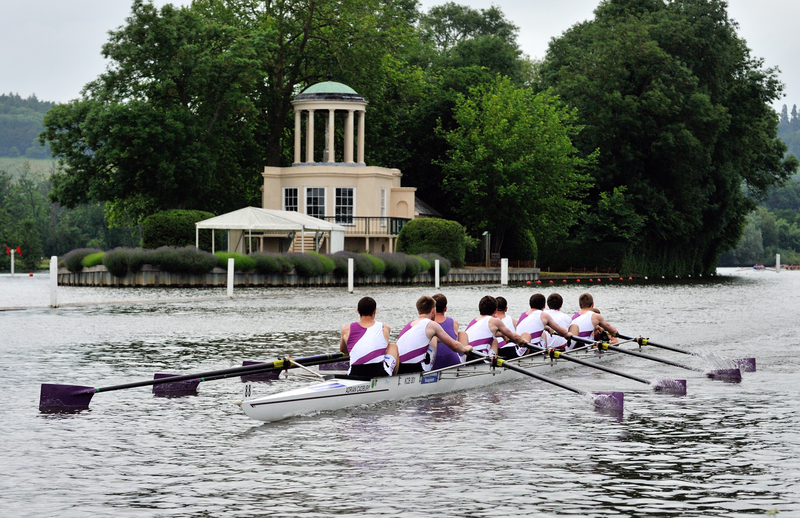 I zoned out and concentrated on our row and when I took a glance at the boats behind it looked like Peterhouse had got Selwyn? We were clear from them anyway, so we had another lift and power 10 into the 1st post corner, 3 horns getting to continuous, Nicole took another tight line around the corner pushing Magdalene wide so that she could get a better line onto grassy. Another lift and power 10 off the corner, continuous and then 3 horns. I was willing the crew to keep down the power, we’d seen Selwyn just miss out twice on bumping this crew and we knew how much determination they had to keep off the crew behind. Lift and power into grassy corner, Nicole going mental, and then ‘Hold it up’!!! 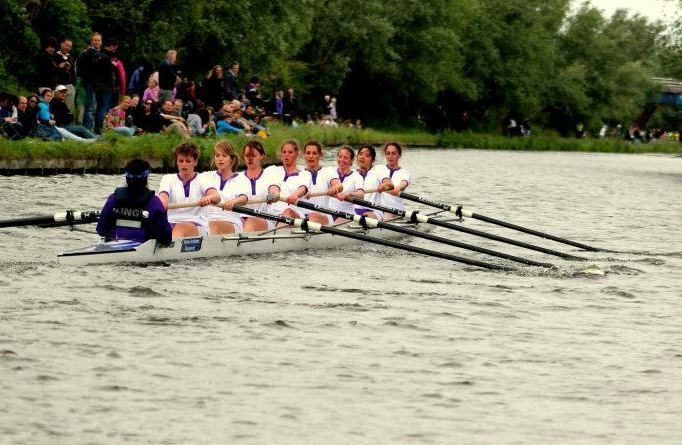 Looking behind Magdalene’s Cox had her arm up, ‘We’d got the bump and quickly’!! Having to pull into grassy corner apparently we celebrated too early – dubious umpiring! But hey we were all so happy!! Then out of nowhere Selwyn, Peterhouse and Murray Edwards come tearing around the corner having to go wide around us! Later we hear that our horns were thought to be the sirens for a major collision up ahead and all 3 had held it up and then continued rowing and then they were made to restart – Drama from King’s AGAIN!! Also, Magdalene were getting whistles on Maggie, they were close to their bump as well. Again King’s wipes a bump from another crew. Up 2 overall (14th), back in the same place as we finished 2 years ago, solidly keeping our place in Lents 1st Div – Well Done. Today M2 were looking to row over and set themselves up for a potential bump of FaT III on Saturday. Unfortunately the start was poor after a very conservative push out and St Catherine’s gained slightly on us. Towards the end of our start sequence we started to push away from them. They called a power ten and started to claw us back. The crew tried to push them away again but the rowing became scrappy as their inexperience started to show a little. As they came within a canvas a last ditch effort managed to hold them off a while longer until we made it to First Post Corner but couldn’t avoid the bump. to do much better for the next two days. After the carnage of the lower boats we finally got under way up to the start. No practice starts so we did a few rolling ones that went well. Spinning at position 16 again this was the day that we were going to get off this spot. The 4 minute cannon went just as we’d pulled in, they were running very late and wanted things to get under way quickly. We were pushed out ready at front stops for the cannon. after grassy we could here the horns after another spectacular corner by cox and the bows. Coming into Plough reach we lifted it up and pushed onto Selwyn, hearing the cheers from The Plough as it was a close one. Nicole took another AMAZING line down plough reach to hit Ditton right on the sweet spot where 2 and 4 could power us around. As we straightened up and we could hear the horns right next to us Nicole’s voice changed, meaning business, she called a lift and then power 10 which is when we collided with Selwyn 7’s blade causing her to crab and get us the bump. Nicole apparently took half a length off them on Ditton corner and Selwyn had overlap at points during the course with Magdalene in front of them. An amazing row girls, we really showed our class on this one.